Adolf Hitler (20 April 1889 – 30 April 1945) ek German politician rahaa, jon ki German Nazi party ke leader rahaa. Uu 1933 me Germany ke Chancellor banaa aur 1934 me dictator ban gais. Uu apne ke Germany ke Führer (leader) maanat rahaa. Uske janam Austria me bhais rahaa aur maut, World War II ke aakhri din me Berlin, Germany me bhais rahaa. Hitler ke palwaar Waldviertel, Upper Austria ke rahin. Hitler, naam German-speaking Europe me 19th century me bahut common rahaa. Ii naam Czech naam Hidlar nai to Hidlarcek se aais hae. 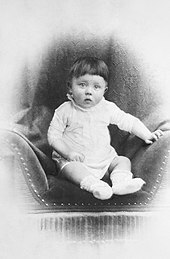 Adolf Hitler was born on 20 April 1889, as the fourth child of six in Braunau am Inn. This is a small town near Linz in the province of Upper Austria. It is close to the German border, in what was then Austria-Hungary. His parents were Klara Pölzl and Alois Hitler. Because of his father's job, Hitler moved from Braunau to Passau, later to Lambach and finally to Leonding. He attended several Volksschule's. Hitler's mother, Klara Pölzl, was the third wife of Alois Hitler and also his cousin. Hitler's father died in 1903. Hitler failed high school exams in Linz twice. In 1905, he left school without an exam. He became interested in the anti-Semitic (anti-Jewish), Pan-German teachings of Professor Leopold Poetsch. In September 1907, he went to Vienna and took an entrance examination. On 1 and 2 October, he failed the second examination. Hitler went back to Linz at the end of October. In December 1907, Hitler's mother died and, because of that, he was depressed. Hitler's mother was Catholic, but Hitler hated Christianity. He also hated Jews. In 1909, Hitler again went to Vienna to study art. He attempted to become a student at the Academy of Arts but failed the first entrance examination. Hitler said he first became an anti-Semite in Vienna. This town had a large Jewish community. ↑ NS-Archiv, 7 April 1925. ↑ Both, Owen (1999) (in German). Der Zweite Weltkrieg. Kaiser. p. 7. ISBN 3-7043-6046-5. ↑ Jetzinger, Franz (1959) (in German). Hitlers Jugend.. Europa-Verlag. pp. 11 f.
↑ Fest, Joachim (1999) (in German). Hitler. Eine Biographie. 2. edition.. Ullstein. p. 43. ↑ 7.0 7.1 7.2 Toland, John (1977) (in German). Adolf Hitler; Biography 1889-1945. Lübbe Verlag. ISBN 978-3-8289-0540-5. ↑ Hitler, Adolf. Mein Kampf. Mariner Books. ISBN 978-0-395-92503-4. Alan Bullock (1991). Hitler and Stalin: Parallel Lives. HarperCollins. ISBN 0-679-72994-1. Alan Bullock. Hitler: A Study in Tyranny. ISBN 0-06-092020-3. Michael FitzGerald (2006). Adolf Hitler: A Portrait. ISBN 1-86227-322-7. Joachim Fest (2002). Hitler. Harvest Books. ISBN 0-15-602754-2. Ian Kershaw (1999). Hitler 1889-1936: Hubris. W W Norton. ISBN 0-393-32035-9. Lothar Machtan (2001). The Hidden Hitler. Basic Books. ISBN 0-465-04308-9. Ii panna ke 12 December 2018, ke 01:14 baje, pichhla time badla gais rahaa.